Hey Google: remember there's a world outside the US, yeah? Google must hate the UK. If actions speak louder than words, that's the only conclusion to come to. And here's the word that proves it: Nexus. On a par with the annual iPhone unveiling, last week saw Google's equivalent: the revelation of the Nexus 7, mark two. Or the Nexus 7.2. Or the Nexus 2, Nexus 7 v 2… We already knew all about it, even though we still don't know what it is we're meant to call the flaming thing. But as the nerds went nuts, the geeks went googly-eyed and the tech press clamoured to get hands-on reviews of this latest, budget, holy grail, there was one niggling question at the back of my mind: why does Google hate the UK so much? I'm not referring to the gloss of the launch event - that was fine. No fuss. No formality. Simple, friendly. Very Google. Over breakfast, even. Every journalist should have been given a small dog to stroke while enjoying the presentation. I'm talking about what happens after. See, the Nexus was supposed to go on release on July 30 in the US, but they couldn't hold in the joy and the tablet went on sale days ahead of schedule. Yet, the big question for me is: "What about us?" And you'll really have to open your Google Wallet if you want to slip one into the jeans pocket the tablet apparently fits into. Love us back, Google. LOVE. US. BACK. For God's sake, Google. You get enough web traffic out of us Brits, so the least you could have done is given us some concrete details to put in the diary. You're quite happy to be building a massive new HQ in the centre of London but when it comes to sharing the love, there's not much Android affection to go around. At the moment we see only a 'proposed date' in September for the UK launch (preorders are being accepted at a few of the larger stores) - and that's just for the Wi-Fi version. The LTE variant has no specified date on offer. This, in itself, is both annoying and worrying. The original Nexus 7 shipped as only a Wi-Fi model and we were happy with that. Well, not happy. But we understood it. Google hadn't made a cellular variant. Simple as. But this time Google's deliberately holding back the LTE version . It hasn't decided against launching it. It's not that nobody's thought to make a cellular version. It's doing this on purpose. What gives? 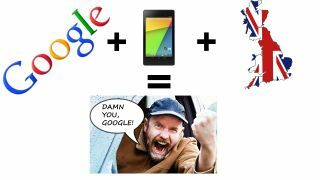 Is Google just trying to maximise sales of the Wi-Fi edition or does it get off on treating British customers with utter contempt? Even at the time of writing, the UK Play Store has no indication of a new Nexus on the way, other than the fact that the old one is now referred to as 'Nexus 2012'. And this is a week after the tablet was officially unveiled. Grrrr. That's assuming we definitely will see the LTE version internationally. We can't begin to imagine Google following the batty lead of Samsung, which launched the cellular version of its Note 8.0 device in other countries but decided Brits could only have the Wi-Fi model. Many punters have had to resort to buying theirs from German retailers to get some signal bars on their display. Madness. And don't forget, Google has form here. Hands up if you remember the Nexus One debacle? Aside from the nightmare ordering process, which was akin to sliding raw chillis between eye and socket (and took considerably more time), that flagship, too, was only released initially in the US. Getting hold of one in the UK involved having it imported (!) or waiting months for it to be made a network exclusive by Vodafone. Big red? How about seeing red! Ultimately, the new Nexus 7 will be released here. The LTE version will be announced. It'll sell out (like the Nexus 4), and like sheep, lots of us will eagerly await delivery of the Wi-Fi version, before wishing we'd waited for the LTE one which, I'll bet, lands just before Christmas. Conveniently. The whole debacle leaves a sour taste in the mouth. Don't be evil? Google, don't be a moron. I've reviewed dozens of phones and tablets for TechRadar over the years – each time putting them through their paces in the most unbiased, rigorous way possible. But as well as being a professional, I have a love/hate relationship with tech, and that's what these columns are all about: the passionate howlings of a true fanboy. Tell me why I'm right, wrong or a hopeless idiot in the comments below or by tweeting @techradar or @phillavelle.